Those of you who work in Microsoft Word may have hit a few bumps in the road when preparing your masterpiece for CreateSpace or another print-on-demand service. In this post, I’d like to offer some basic tips for working with section breaks and page numbering in Word. What is a section break and why do we use them? For fiction writers, page numbering is the most common reason for using section breaks. How do I add a section break? 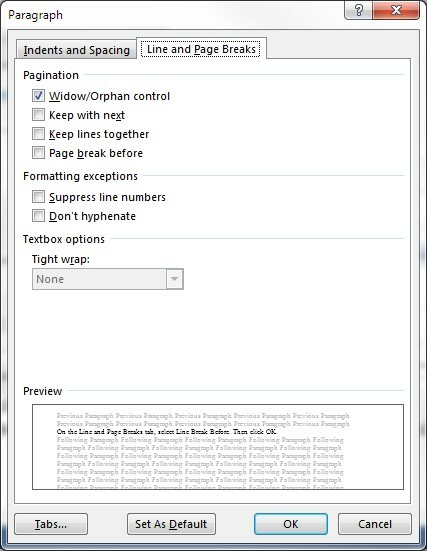 The Break options are located on the Page Layout tab of ribbon. If it is important that your new (next) section starts on an odd page, select Odd Page. If not, select Next Page. If your document already has section breaks and you want to see where they are located, click the Show/Hide paragraph marks and other hidden formatting symbols button on the Home tab of the ribbon. Note: If you are on an odd page and you select Odd Page, a blank page will be inserted. That was easy enough. So what’s the big deal? For most people, the troubles begin when they start to modify the headers or footers in their new section. A few simple precautions can help avoid this problem. When you double-click on your header/footer to open it, the header/footer information includes the section number and if it is linked to the previous section, Same as Previous appears. In addition, the Link to Previous option is enabled on the Header & Footer Tools ribbon. Before attempting to make changes to the layout of your new section, you need to disable the Link to Previous option for the header or footer that you want to edit. Doing this does not remove the existing content – but it does allow you to make changes in a section without affect the previous one. Important: If the section you need to edit is located between two other sections, disable the link option in the section that follows as well. If you do not do so, the changes in section 2 will be applied to section 3, and so on, until there is a section where Link to Previous has not been set. The page number options are located on the Header and Footer Tools ribbon. To change the number format, select Format Page Numbers. In the dialog box that is displayed, you can set the type of numbering (1,2,3; a,b,c; i, ii, iii; and so on). You can also define the numbering to start from a specific number or to continue the numbering from the previous section. A common use case for non-fiction documents is to use roman numerals for the front matter (TOC and such), and then start the “meaty” content from page 1. To do this, the numbering in Section 1 of the document would be set to roman numerals, and set to start at i. After disconnecting the linking between Section 2 and Section 1, the numbering can be set to start from 1. Tip: If your book/work is contained in multiple files, use the Start at option to set the numbering accordingly. For example, if your first file ended on page 92, the next one might need to start on page 93. So you don’t want a page number to appear on your cover page, how can you make it go away without messing up the numbering on the next page? With your cursor on the cover page, on the Page Layout ribbon, select Page Setup. Select the Different first page checkbox. Verify that This section is selected from the Apply to dropdown list. Now you can delete the number from the bottom of the cover page without affecting the layout of other pages/sections. Section breaks also enable us to insert pages with different layouts – for example, landscape vs. portrait orientation. A word to the wise – if you need to insert a section with different layouts, always insert two section breaks (one before and one after the content) and disconnect Link to Previous in the new section and the section that follows before making any changes to layout! Have any tips of your own? Feel free to comment and share your ideas. If you are anything like me, you don’t have a humongous budget for graphic design and marketing. This doesn’t mean that you can’t create eye-catching info-graphics or memes to enhance your marketing efforts. If I can do it, so can you. Here are a few I have created. In this post, I’d like to take you through the basics of creating a simple marketing graphic in Microsoft PowerPoint. For the purposes of this demo, the info-graphic will incorporate a background photo, a book cover, and promotional text. Before you begin: Identify and download one or more photos/graphics that you might like to use. Or, even better, maybe you have a photo you took yourself. I usually download something from pixabay.com or a similar site that offers free images (including for promotional/commercial use). Note: If you select a picture with people in it, there are likely to be some restrictions, so tread lightly and read the fine print. Select the Insert tab on the ribbon, then select Pictures. Browse to and select the picture you want to use, then click Insert. The picture appears on the open slide. Tip: To adjust the picture size, click and drag a corner of the graphic inward or outward. Select the Insert tab, then select Pictures again and insert your book cover graphic. Select the Insert tab, then select Text box to add text. Simply click the canvas and start typing. Now I have three elements on my canvas: the photo, the cover, and some promotional text. First, the cover needs to be a bit smaller relative to the dolphin photo. Click the cover and then drag the corners to adjust the size. Drag and drop the cover onto the photo. Select the text box and drag it onto the photo. 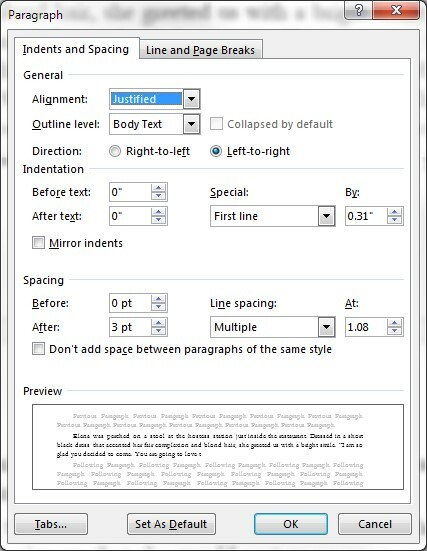 Select the text box and adjust the font size, style, color, or other special effects using the options on the ribbon. Reposition and resize the cover and text box until you achieve the desired effect. On the Home tab on the ribbon, select Copy or press Ctrl+C. On the Home tab, select the dropdown arrow on the Paste button to display the Paste Options menu, then select Paste Special. From the Paste Special dialog box, select Picture (JPEG), then click OK.
– Yes, you could skip this step, but there is a method to my madness. Creating a “picture” rather than the default Microsoft object enables you to resize the graphic, crop it and add borders, without messing up the positioning or relative sizing of the elements. For example, the info-graphic here has been cropped using the Crop tool on the Picture Tools ribbon. – The recommendations for overall size vary, I tend to make it around 2.5” by 5” (I confess I’m not consistent). Play around and see what works best for you. Finally, right-click the finished info-graphic and select Save as Picture. Once saved as an image*, the picture is ready for use in your next tweet or Facebook post. Note: I recommend saving your graphics as .jpeg files. You can save pics in a variety of frameworks (GIF, JPEG, PNG, and so on). I have found JPGs work well. Don’t want to use a background photo? Try drawing a rectangular shape and set its color, shading, or other effects. Found a great picture of snowflakes for a winter info-graphic but you don’t like the rest of the picture? Crop the picture to use the portion you like (enlarge what’s left if need be). If you are adventurous you can apply a variety of effects to pictures in PowerPoint. Images for BookBub ad graphics must be 300 x 250 pixels. Image for posting to Instagram must be square. Hope you find this post helpful. Please feel free to offer your own tips or ask questions. As someone who spends way too much time on social media and not enough time working on my WIP, I really appreciated this post by Eve Messenger. In a previous post, I discussed the importance of editing and proofreading your masterpiece before publishing it. With sophisticated word processing applications, editors/proofreaders no longer mark up printed copies and leave it to you (the author) to manually input revisions into your document. For those of you who work in Microsoft Word, I’d like to offer up some basic tips on working with Word’s Track Changes feature. Why track changes and how do they work? The person reviewing/reading your file turns on Track Changes. Every change they make is tracked. When you get the file back, you can browse through the document and accept/reject their changes as you see fit. For example, if your editor has fixed a typo or done a wonderful job reworking that sentence, you can accept the change – or if it you don’t agree with the change, you can reject it. The Track Changes options are located on the Review tab of ribbon. In the Tracking section of the ribbon, click the Track Changes icon. By default, text and formatting changes are tracked and the Tracking view is set to All Markup, meaning that all edits are visible. (More on views later) Tip: Turn on the Track Changes and save your file before sending it to your editor/proofreader. When they open the file, they will already be on. You can browse through the suggested revisions using the options found in the Changes section of the Review ribbon using the Previous and Next buttons. When the cursor stops at a suggested revision, click Accept or Reject as you see fit. The cursor automatically jumps ahead to the next revision. Not sure how you want to handle that one? Click Next and come back to it later. If you want to accept the change and reread the resulting sentence before moving on, click the dropdown arrow and select Accept This Change. After you closely check the result, click Next. Warning: In theory, you can also click the dropdown arrow and select Accept All Changes. I do not recommend this. If the reader/review/editor asked you a question or made a comment in the body of the text, it will be accepted too. Not good. For all you proofreaders/editors – best practice for leaving comments/questions is to use Word’s Comment feature. This way they can’t be accidently assimilated into the body of text. There are four different viewing options for documents that have tracked changes. All Markup shows all of the suggested revisions. Simple Markup shows some but not all of the suggested revisions. Original shows the original text (what would be left if all of the tracked changes are rejected). Tip: If you print a document or create a PDF of a document with tracked changes, those changes are displayed (or not) based on the view selected. Important: Before converting/uploading your completed manuscript to KDP, always make sure that all tracking has been removed. As an indie author, you are responsible for the entire publishing process – writing, editing, proofreading, publishing, and marketing. But that doesn’t mean that you should do it all yourself. Even if you are working with a low or almost non-existent budget, make sure that you get someone else to participate in the editing process – someone that has editing experience and who won’t be shy about pointing out problems in your manuscript. Your editor can be a paid professional editor or a qualified and capable friend. You should never unleash your masterpiece on the world without having it properly edited. Before you submit your work to your editor, make every effort to weed out as many of the errors in your manuscript as possible. Eliminating simple typos, extra spaces, and so on, will make it easier for your editor to focus on the story flow, the wording, and the important stuff that you simply don’t see because you are too close to the story. You can use the Find option on the Navigation view to identify the frequency and location of words that you know you tend to overuse. On the far right end of the Home ribbon, click Find. The Navigation view opens automatically. Type a word or phrase that you want to locate in the field. The number of times that the word or phrase is found is listed and the specific instances are highlighted in yellow in the body of the document. I was then able to browse through the document using the up and down arrows and consider ways to vary my phrasing more – especially when those yellow bits were clumped together. You can use the Find and Replace option to kill off extra spaces in your manuscript by selecting Replace on the far end of the Home ribbon. What extra spaces should you delete? The Find and Replace feature searches for a specific string in your document. A string can include any number of characters and words, including spaces. This makes systematic removal of extra spaces really easy. On the far right end of the Home ribbon, click Replace. In the Find what field, type two spaces (hit the space bar twice). In the Replace with field, type one space. Click Find Next, then click Replace All*. Using the same method, you can find and remove spaces before other punctuation marks. In the Find what field, hit the space bar once and type the punctuation mark (comma, colon, semi-colon, or question mark), then in the Replace with field, type only that punctuation mark. *This is generally a safe option unless your document contains programming code or some other text that must not be changed under any circumstances. Almost every word processor has a spell checker of some sort. Always run the spell checker before submitting a document for any kind of review! It won’t catch all your mistakes, but it will help you pick off lots of typos. To run a spell check in Microsoft Word, click Spelling and Grammar on the left end of the Review ribbon. Important: Never accept spell check recommendations without looking at them. And if the recommendation pertains to grammar, look twice before accepting them. Best intentions aside, automated spell checks are not infallible. First, select the entire document by pressing Ctrl + A. Next, on the Review ribbon, in the Language section, click Language > Set Proofing Language. In the Language dialog box, select the dictionary language for checking your text, for example, English (United States) or English (United Kingdom), then click OK. So the editor has done their thing and you have done your best to implement the necessary revisions. That’s great. But don’t rush to hit Publish just yet. New errors tend to sneak in as a byproduct of the revision process. Words somehow end up stuck together (no space between them) and extra spaces multiply like rabbits. Run the spell checker again, and then search for and remove the extra spaces. Manually proofread your document, and if possible recruit as many people as possible to proofread and/or beta-read your masterpiece before its release. To the best of my knowledge, a single space is the industry standard for typesetting/publishing these days. I, too, was taught to type two spaces after a period but that was back in the days of typewriters (and other dinosaurs) when all characters and spaces took up exactly the same amount of space (width). Today, modern fonts implement kerning – which basically means that the width of letters is not uniform (think “m” vs “i”) and spacing autoadjusts if your text is justified on both sides so that your text reaches both margins. Sometimes an extra space can make the difference in how the text sits on the line, whether that last word fits on the line or goes onto the next line resulting in very spaced out text. Like it or not, indie authors have to be proactive on social media if they want potential readers to discover their books. 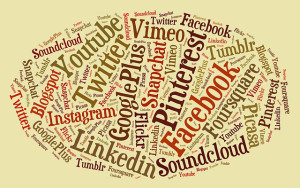 Twitter is one of the most popular avenues for getting the word out. In this post I offer a few suggestions on how to manage your tweets and promote others at the same time. In Microsoft Word or Excel, create a Tweet roster that contains tweets that you are likely to reuse. You can organize them into categories (tweets about your book; tweets about friends’ books; great quotes; blogs to visit and tweet tips from, and so on). For example, as a member a writer’s group that encourages cross-promotion, I try to make a point of retweeting something about a different member’s book every day. To this end, I started a list of simple tweets that include the name of the book, its genre, the twitter handle of the author, etc. and maybe even a short quote from a review/description. And, of course, a shortened or direct link to the book. I started with a list of 8 tweets; it has grown to almost 60. When I find I have some time on my hands, I create a few more. I then schedule the tweets on a rotating basis. If you’re anything like me, you can’t spend all day on Twitter. So I use software to schedule the tweets in my rosters for at least a week in advance. There are several different types of software available – most have both free and paid (upgraded) options. I have found that using FutureTweets to schedule my twitter posts has been quite helpful. I use the free version. There does not seem to be a restriction on the number of tweets you can schedule or how far in advance. The only limitation I have encountered is that you cannot schedule the same exact tweet repeatedly. You can sign up at futuretweets.com. UPDATE – Feb 16, 2016. After experiencing some problems with the availability of FutureTweets – although their webpage indicates that the problem have since been resolved. In the interim, I switched to using Tweet Deck, which also has a free version. It is a good product, however it has a more complex interface. Enter your tweet text, including hashtags in the textbox. The counter tells you how many characters you have left. Click Schedule. The tweet is added to your list of scheduled tweets. That’s it. Your tweet is scheduled and will go out at the designated time. Click the corresponding Edit [pencil] icon, edit the content, then click Save. Click the corresponding Delete [red circle w/slash] icon. You cannot schedule the same exact tweet repeatedly. This functionality is not allowed by Twitter. When the scheduled time rolls around, that identical tweet will not go out. My workaround for this is to copy my tweet content from the text box* and use it as basis for additional tweets by pasting it and making some tiny change in wording or in hashtags. Not ideal, but has the advantage of getting me to vary my use of hashtags and prompts – which is actually a good thing. *If you copy the tweet content from the list of scheduled/sent tweets, the link won’t be there. Click Edit, copy the content, then click Schedule to get a new empty tweet text box. So how do you schedule tweets? Feel free to comment and share your ideas! Indie authors are amazing. Right? Of course, they are. And so many of them are tackling the task of publishing their work on incredibly low or almost non-existent budgets. There is a natural reluctance to pouring lots of your hard-earned money into that pet project – your novel. As a result, many writers opt to go the Do It Yourself (DIY) route. In actuality, DIY formatting in Microsoft Word is easy – if you know what to do and what not to do. Nonetheless, in recent months, I have found myself flinching in the face of messy formatting in some of the books I have picked up. In this post, I’d like to offer my fellow indie authors a few pointers on preparing their masterpieces for publication as e-books. First of all, a few words about Print vs. Kindle formats. When you are finalizing your print layout (usually creating a PDF), the what-you-see-is-what-you-get-rule applies. With ebooks this is not true. Ebook formats magically repaginate the flow of text on the screen for different device sizes (margins and page lengths vary) and according to the reader’s viewing preferences. 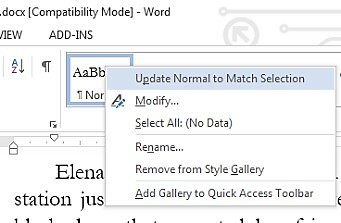 Take advantage of the Styles feature in Word. For most fiction books, you only need to use a few styles. Normal for your regular text paragraphs and Heading 1 for your chapter starts. Maybe something special for the inside cover, and a couple more depending on specific content. To indent or not to indent? I am not going to address that question – there is no one correct answer. But if you want to indent the first line of each paragraph, please do not hit the space bar multiple times or hit the Tab key. Set up your Normal style to include that indent. Select a paragraph to create a sample that looks the way you want it to. Right-click the paragraph and select Paragraph. On the Indents and Spacing tab, in the Indentation area, select First line from the Special dropdown menu. Then set the amount of the indent. In the example shown the indent was set to 0.31″. Now, to apply the characteristics of that paragraph throughout your document, right-click the Normal button in the Styles section on the ribbon and select Update Normal to Match Selection. Word does its magic and all the “Normal” text in your doc looks the same (indent, font type and size, and line spacing too). I prefer to start each chapter on a new page (or screen). This is best done using a defined style like Heading 1 – it should not be done by inserting blank lines. To start each chapter on a new page, right-click a chapter name and select Paragraph. On the Line and Page Breaks tab, select Line break before. Then click OK. If you don’t like the look of the Heading 1 that is in your default Word template, you can change it using the font, size, and centering options on the ribbon. Now, to apply these characteristics throughout your document, right-click the Heading 1 button in the Styles section on the ribbon and select Update Normal to Match Selection. Word does its magic and all the “Heading 1” text in your doc looks and behaves the same way. To keep paragraph A on same page as the paragraph that follows, right-click paragraph A, select Paragraph and then select Keep with next. To make a line/paragraph start at the top of a page, right-click it, select Paragraph and then select Page break before. Note: Changes made to a specific paragraph do not affect other instances where the style is applied unless you then select that paragraph and update the style defintion to match (as explained above).